Rajasthan GK Question in Hindi Sample Paper 190: Rajasthan General Knowledge Sample Question Paper with Collection 10 Question of Rajasthan GK Questions based on RAS PRE Question Paper 2015 for RAS, Rajasthan Police, REET, SI, Contable, Patwari and other state exams under GK Quiz in Rajasthan GK Sample Papers. 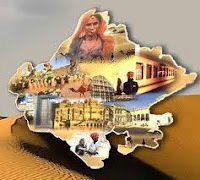 You can download Full Rajasthan RAS PRE Question Paper 2015 under STATE PSC Papers Tab of INDIA GK Mobile App with other General Knowledge (GK) and General Studies (GS) Questions from various examinations of Rajasthan Govt. and central Govt Examinations. Q.3521. The place which is famous for its Terracotta Craft is ? Q.3522. The GOGA NAVAMI is called ? Q.3523. If 23*5=26 and 13*8=19, then 39*7= ? Q.3524. Tejaji Fair is organised at ? Q.3525. The veer Bharat Society was established at Kota by ? Q.3526. The Number of all integers N for which N(2)+48 is a perfect square is ? Q.3527. Kshetrapal has been an important aspect in the culture of Rajasthan as ? Q.3529. The Sect which believed in abiding nature of destiny ? Q.3530. Which of the following Texts has not been written by Kumbha ?